Catch up on the phenomenon of Mrs. Browns Boys! Featuring all three full seasons of the hilarious comedy – Mrs. Browns Boys PLUS also the new Christmas Crackers DVD. All packed together making it the perfect gift to give this Christmas, or indulge yourself in side splitting laughs with Agnes and the Brown family. Brilliantly funny Irish comedian Brendan O'Carroll stars as out-spoken Irish mammy Agnes Brown in this brand new comedy series. Join Agnes Brown as she indulges in her favourite pastime - meddling in the lives of her six children! Whether she's tackling love, life, death or dealing with the in-laws - Mrs Brown is one mammy that you don't mess with. Prepare for a riot of bad behaviour - It's a little bit rude, a little bit crude and hysterical fun for everyone. THE 'MAMMY' OF COMEDY IS BACK AND BADDER THAN EVER IN HER SECOND SERIES. TV's funniest and proudest mother, Agnes Brown, is back with the second series of her hit BBC comedy show. Mrs Brown, the loveable Dublin matriarch, continues her quest to meddle and interfere in the lives of her long suffering 6 children, with even more shocking and hilarious consequences. The most endearing mother hen is funnier than ever in her side-splitting second series. Thought you'd seen Mrs Brown at her most outrageous in series one? Well, you ain't seen nothing yet! 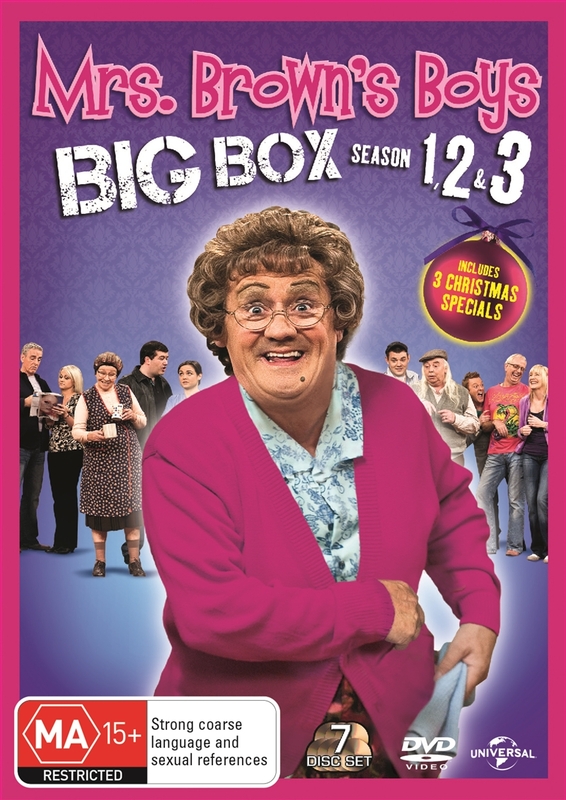 All six episodes from the third series of the Dublin-set sitcom depicting the life and times of Mrs Agnes Brown (played by writer/director Brendan O'Carroll) and her unruly brood. In this series, Cathy (Jennifer Gibney) lets slip that she's thinking about breast implants to please Professor Clowne (Mike Pyatt) and Agnes is eager not to spend another Valentine's Day on her own. Feast yourself on this triple helping of Mrs. Browns Boys with the outrageous Christmas Specials. As always, Agnes is only trying to make Christmas perfect for her family but things don’t always turn out as planned. We see Agnes competing for the love of Dermot and Maria by trying to provide a more lavish Christmas than Marias posh Mum Hillary. Trouble brews as Cathy takes exception to her mother opening all her mail and instigates a clever plan for revenge. And Agnes fights to stage her very own Nativity play and she is determined to put on the greatest show on earth. Join Agnes and the Brown family for an extraordinary Christmas you won't forget.